First published in 1995. 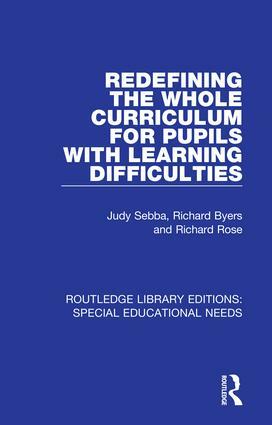 This book is about the issues in the education of pupils with learning difficulties. It redefines the relationship between the established curriculum for pupils with learning difficulties, the whole curriculum and the National Curriculum within the context of personal and social development. Particular themes running through the book include the ways in which the individual needs of pupils can be met through group work and planning for meaningful pupil involvement. Judy Sebba became Director of the Rees Centre for Research in Fostering and Education at Oxford University in 2012. Under her leadership, the Centre has become known nationally and internationally for its research into improving the life outcomes of children in care.